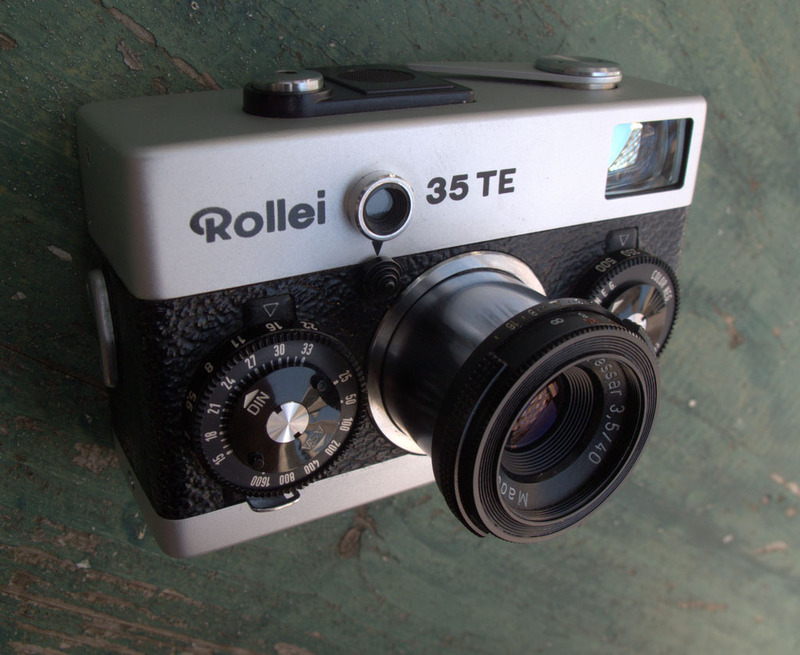 I bought a Rollei 35 TE recently that had a couple of issues and it was driving me bonkers that I could find very little information online about this great camera. Everything I could find, including the service manual, was for the previous generation 35, S and T series cameras. 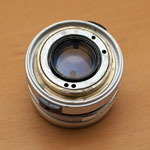 The issues with my TE were in the meter and lens barrel. 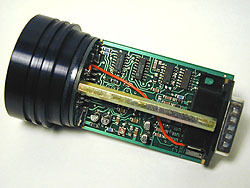 The lens barrel was loose and when retracted the lens kept flopping out. 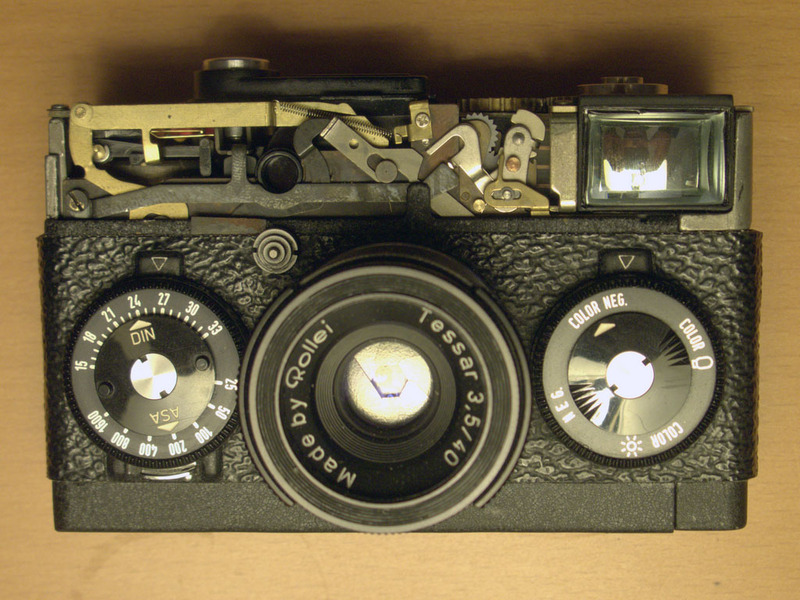 (This is common ailment with all Rollei 35 cameras.) The other problem was that the meter would not auto-off after 10 seconds as stated in the manual. It was always on as long as there was a battery in the chamber. Metering was spot on and agreed perfectly with my Gossen Lunasix3 and the camera still took a great picture despite these issues but they were quickly becoming a major annoyance. Since all the repair estimates I got were for much more than what the camera cost me (and often more that what I could realistically sell it on eBay for) and did not guarantee the meter could be repaired or replaced (in fact most were convinced it could not) I decided to try to fix it myself and document the process for others that might be facing the same issues. For those doing a repair and in need of extra detail, you can see the full size versions of all the photos in this post by following this link. 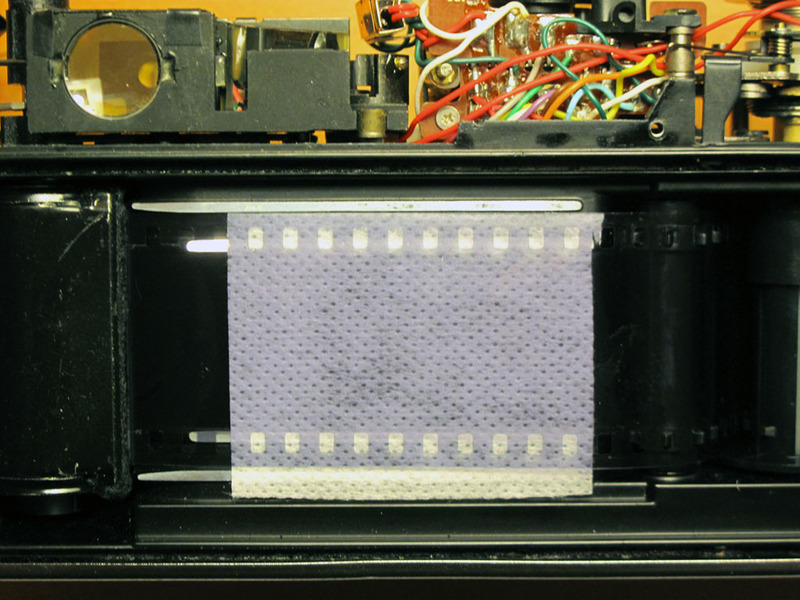 I started with the film advance crank removal as this is usually where I have the most difficulty. In this case the crank cover scew came off without too much force. Underneath it is a small copper washer and the crank itself held in place by three screws as seen in the photo here. 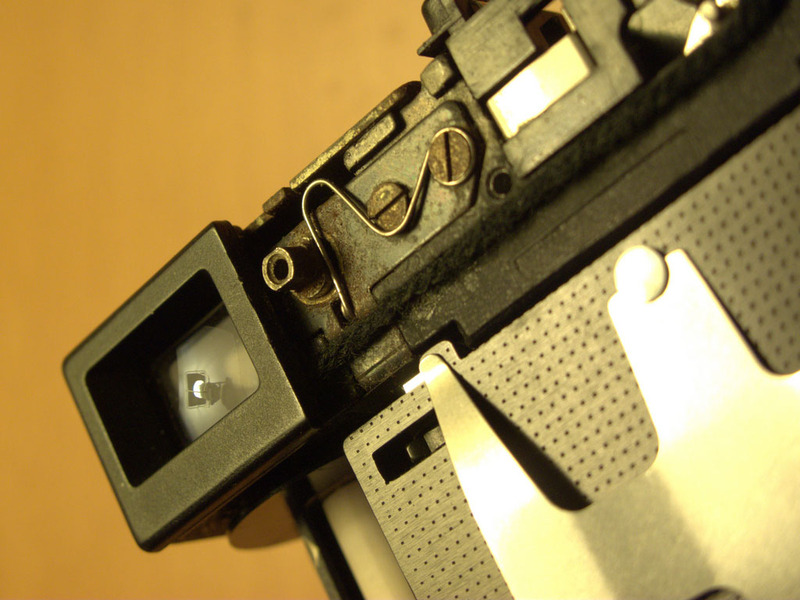 Next there are 2 philips-head screws on either side of the camera and the rest is on the back: the battery lever cap, another flat-topped screw in the middle of the camera and the rewind lever. The rewind lever has a collar underneath the tab as seen in the 2nd photo. 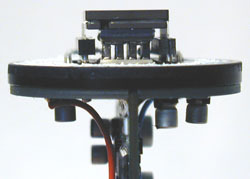 At this point the top cover is not yet ready to be removed as it will not come off without first removing the rewind pin which is held in place by a spring. If you look closely at the rewind pin, you will notice that it has a flat side at half-way between the up and down positions. The pin needs to be turned half-way so the flat side is against the spring so it can be pulled straight out. Use a very small pliers and you may need to use the tip of an x-acto blade to push spring out of the way. Only once pin is removed can the top cover can be pulled off without damage. 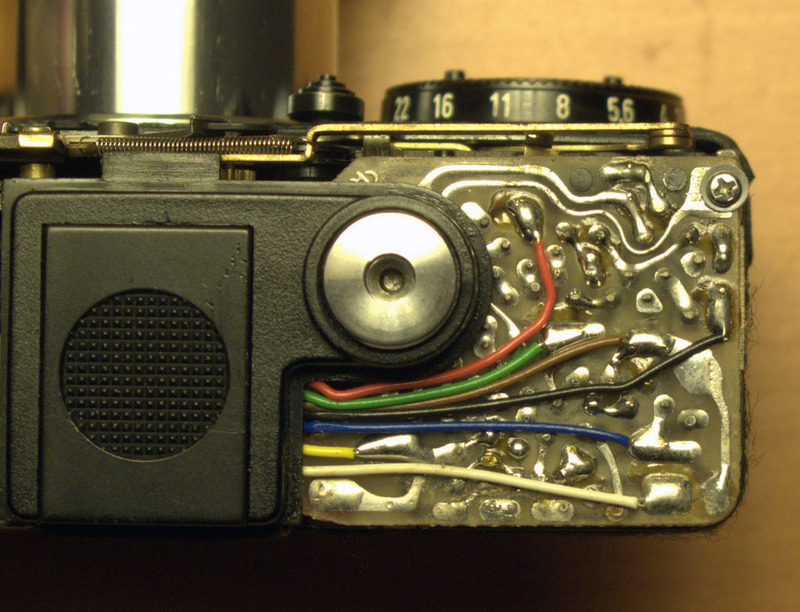 In the 3rd photo the top cover has been removed and you can see the rewind pin, the retaining spring and the position the pin needs to be in for removal. 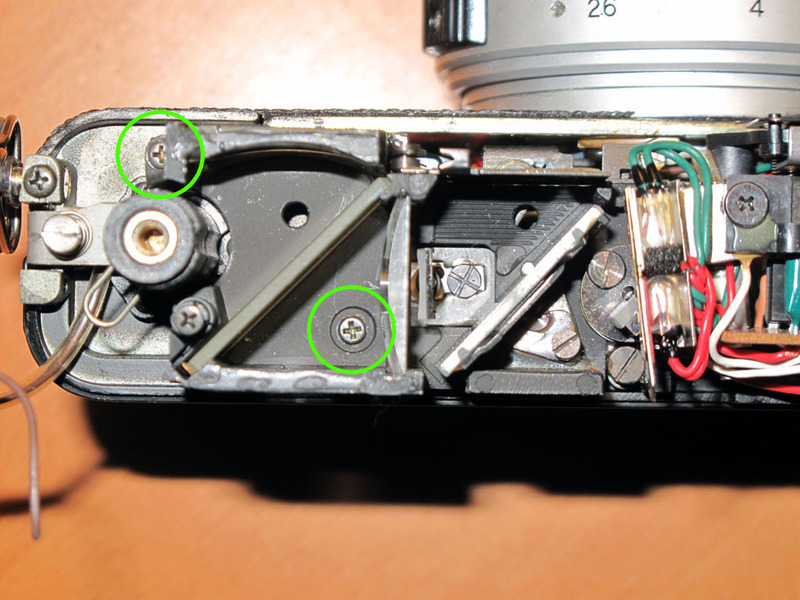 When reassembling the camera, there is trick to getting the pin back in place properly. 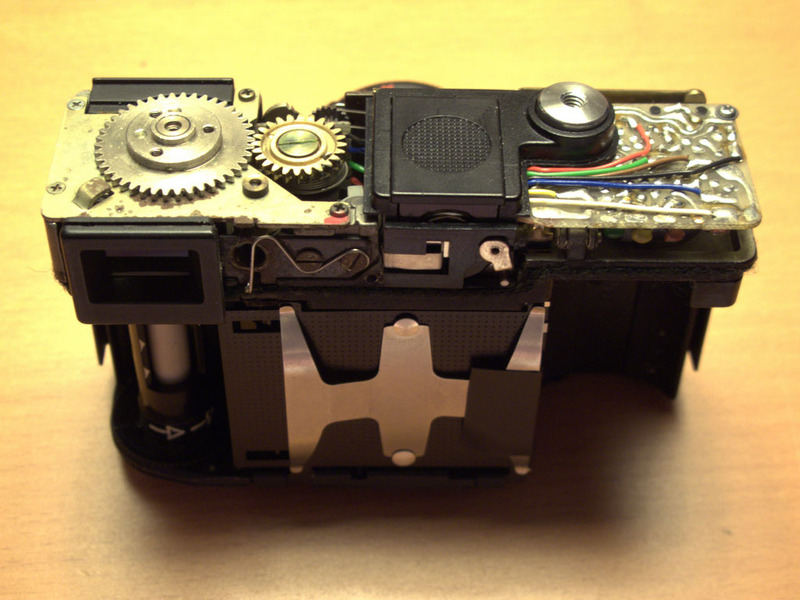 The rewind pin pushes up a metal rod inside the camera (seen in the final photo) that unlocks the film sprocket (the toothed wheel that the 35mm holes fit in to directly below it) allowing the film to be rewound. Use small screwdriver to push inner rod up and it will lock in place. This is the only way the rewind pin will fit in back in. 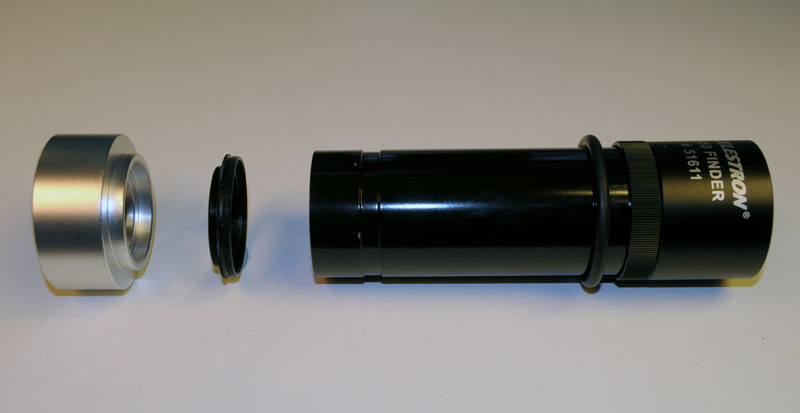 The rod will pop back down when you rotate the film sprocket by hand. Try this a couple of times before attempting to put the top cover on. 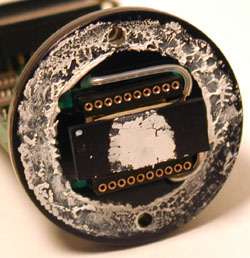 Again, you may need to use the tip of an x-acto bade to push the spring out of the way when reassembling. 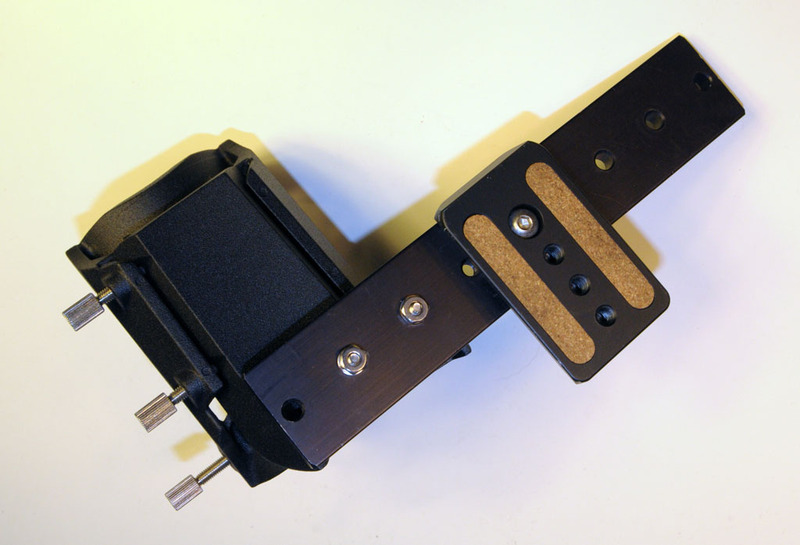 Once completed, replace the rewind collar and lever, screw it in place and test it out before finishing reassembly. 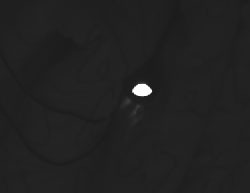 This was what led me to do this surgery on the camera in the first place as I found it a real pain having to pop-in, pop-out the battery all the time. 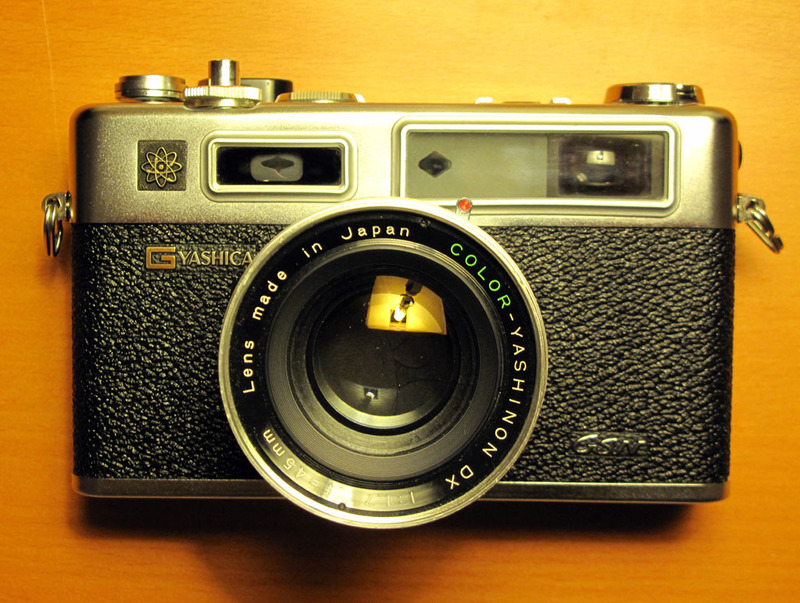 A quick test roll showed that the metering was great (I had already checked it against my Gossen Lunasix3) and it could take a great pic, but the auto-off issue was keeping from using the camera effectively. 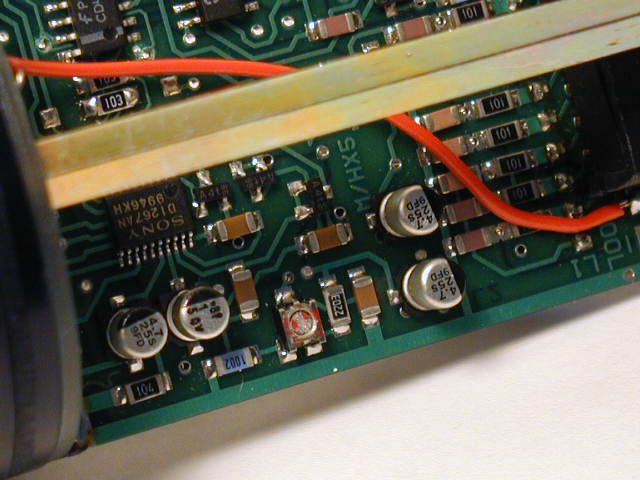 As soon as I pulled the top cover off I noticed some dry, white powdery gunk under the white wire on the circuit board as seen in the photo here. 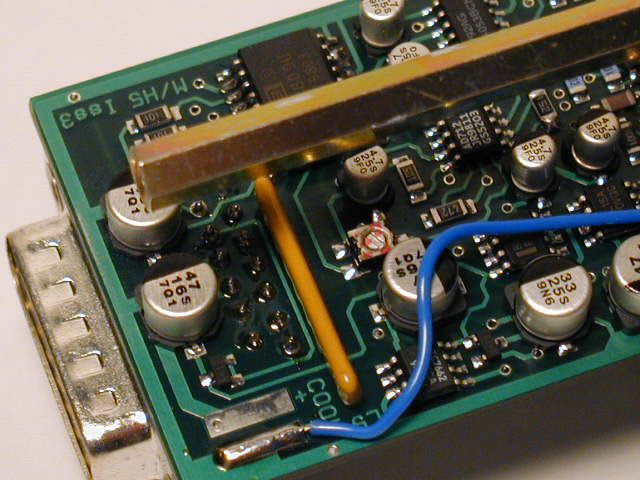 I scraped it off the circuit board between solder joints with tip of small flat-head screwdriver and happily (amazingly!) 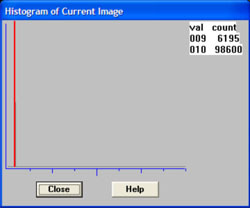 the meter immediately started functioning as it should with auto-off after 10 seconds. I figure this was corrosion of some sort that was causing a short and preventing the meter from turning off. 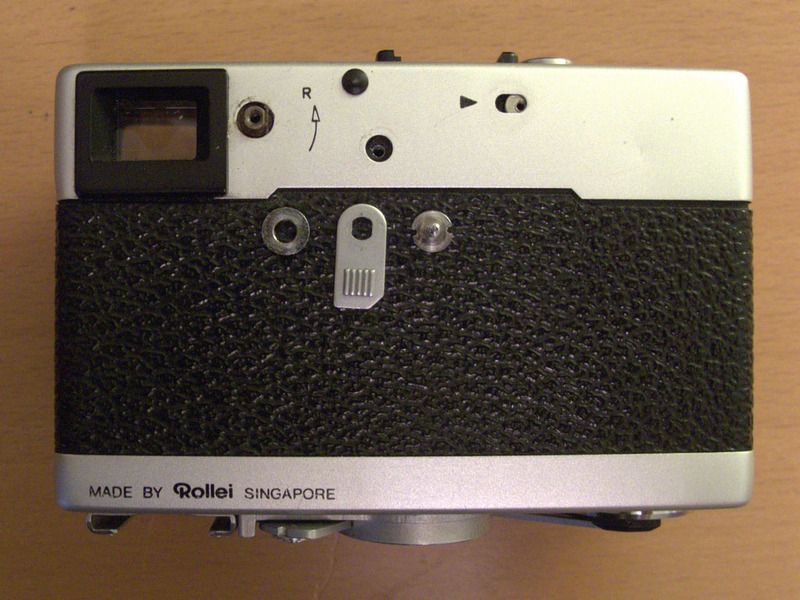 This was the only issue that I could find any information about online as apparently affects a lot of Rollei 35’s. Unfortunately, the fix requires breaking down the camera even further to replace a friction collar inside the camera body and I really didn’t want to go to those lengths as all those mechanical bits looked like a little more than I knew how to deal with. Instead I had the idea of going in through the front of the camera between the lens barrel and the collar that holds it in place. 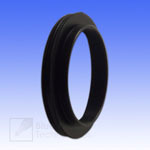 Whatever I used needed to be adhesive on one side so it could stick to the inside of the lens collar and stay in place. I tried some flocking paper left over from another project but it was way too thick and after a little experimenting discovered that a simple yellow Post-It was the perfect solution — it was just the right thickness and the adhesive was not too so strong as to make it difficult to work with. I cut off the the adhesive strip from a fresh Post-It and trimmed it so it was about 1.5cm wide. With the camera fully assembled and the lens locked in place, I slid the Post-It between the lens barrel and collar with adhesive side outward against the lens collar and worked it into the camera af far as it would go. This should only be about 2-4mm. 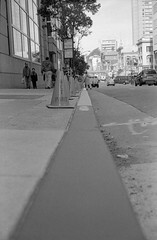 I found the best place on my Rollei was at about the 2 o’clock position of the lens barrel. 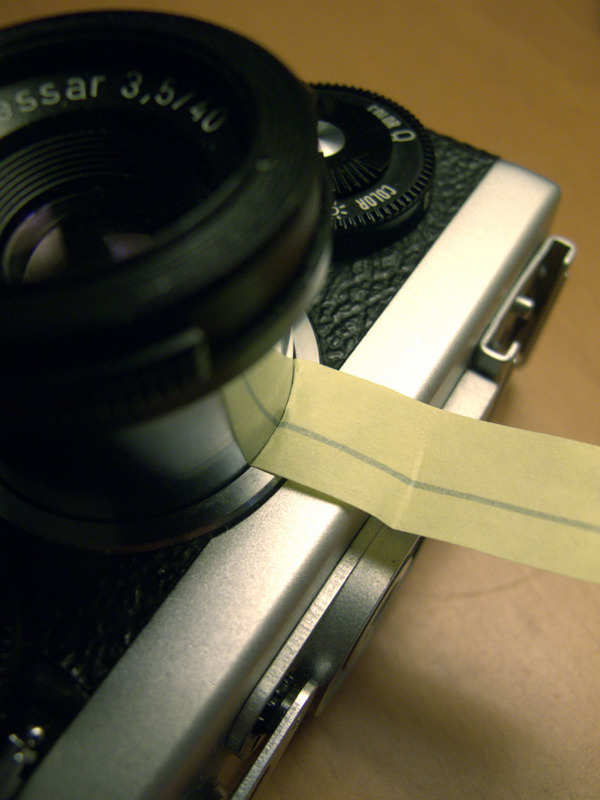 Once the Post-It was in postion, I folded it down against the body of the camera, unlocked the lens and slid it in and out to test if the friction was enough to hold the lens and if the paper would stay in place. Once I was satisfied with the positioning, I used an x-acto knife to trim off the excess paper and then a black sharpie to paint over yellow Post-It color. 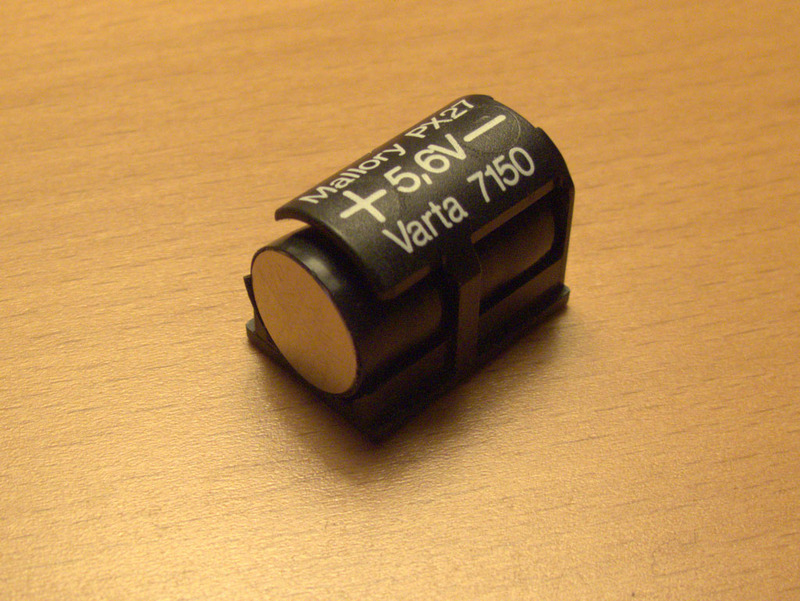 Basically, the idea is to use three LR44 batteries and one LR43 battery wrapped in electrical tape to hold them together. With the thinner LR43 in the set the length is perfect and you can wrap enough tape around them to increase the diameter until you get a snug fit in the holder. 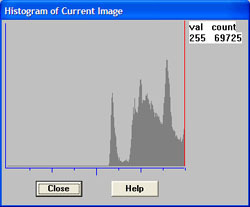 (I didn’t bother and it works fine.) Best of all, these batteries are easy to find, comparatively cheap and they last forever. All together they produce 6V but the TE / SE meters don’t seem to mind the slight over-voltage as much as the previous generation meters did. 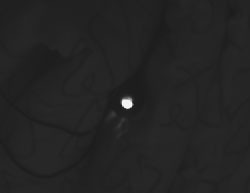 So it’s not strictly necessary, but you can use a single depleted cell in the set to get closer to the camera’s native 5.6V. I haven’t really noticed a difference either way. 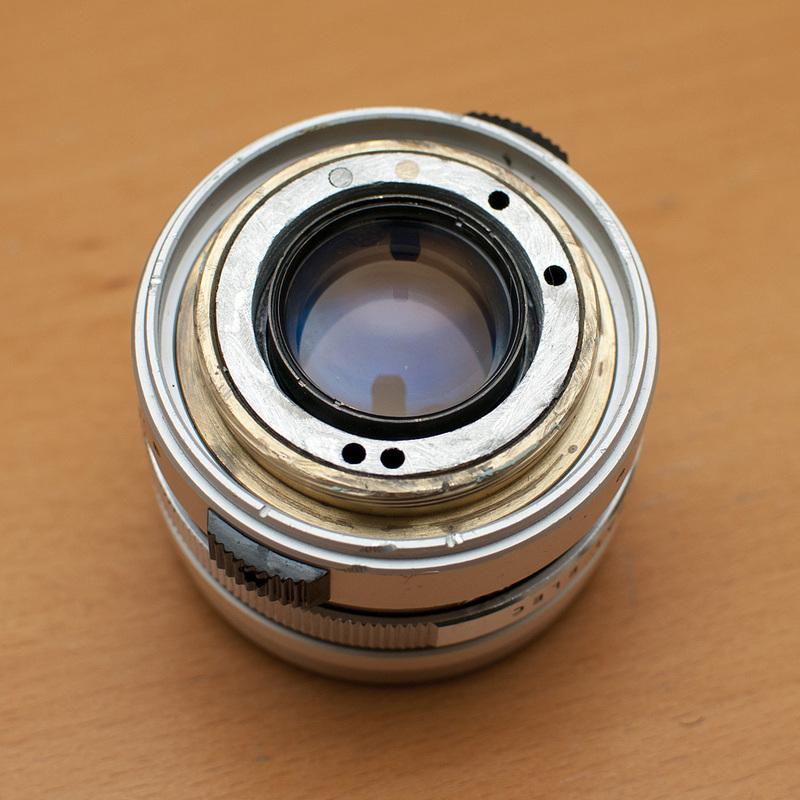 The second attempt was an eBay buy that was maybe a 9.5 cosmetically and sound mechanically but had one major flaw which made it a pain to use… The rangefinder spot in the viewer that is used to focus was almost non-existent. It had just the barest ghost of an overlapping image which made focusing difficult even on bright days. Since I had the parts from a whole other camera, (happily the focusing mechanism on the broken GSN was in stellar shape) I decided it was high time to perform a little surgery and build… a Frankie. 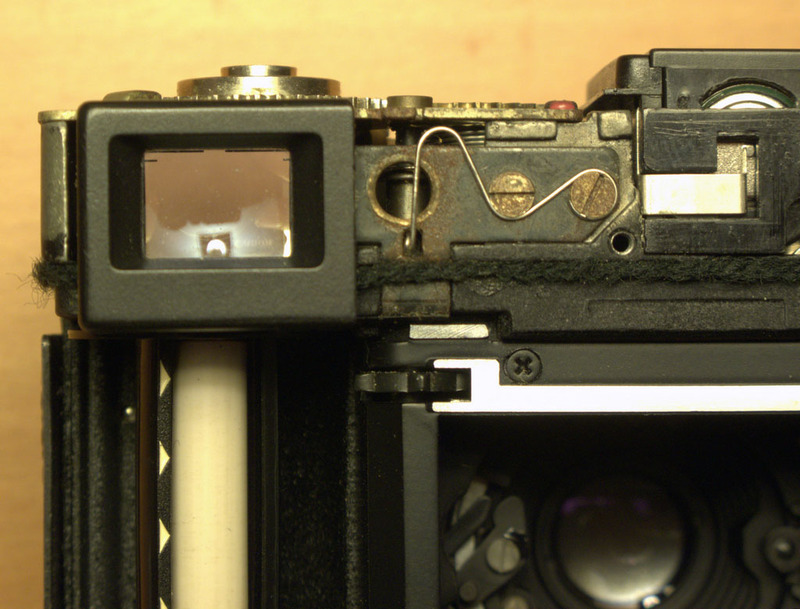 You can see in the photo on the right just how bad shape the old rangefinder mechanism was in… The top one was the mechanism I replaced and you can see how the diagonal piece of glass there is nearly transparent. 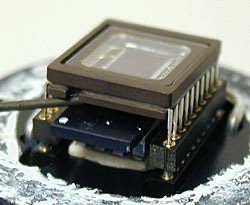 This gold coated piece of glass is basically a beam splitter that superimposes the focusing area on the view through the lens. 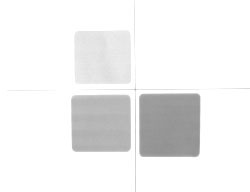 With the coating nearly gone as in the top photo, very little was being reflected and consequently the focusing area had pretty much disappeared. 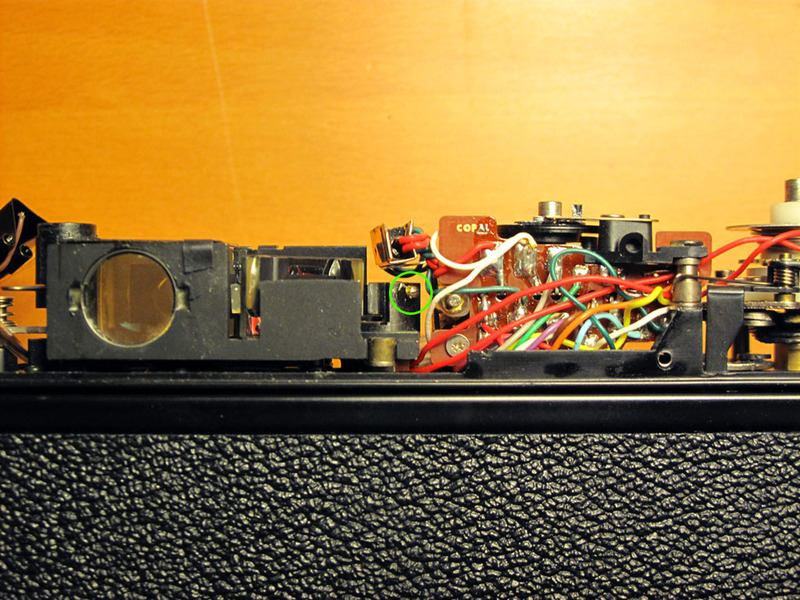 There are other sites with instructions on disassembly of the GSN so I won’t go too much in to that here. 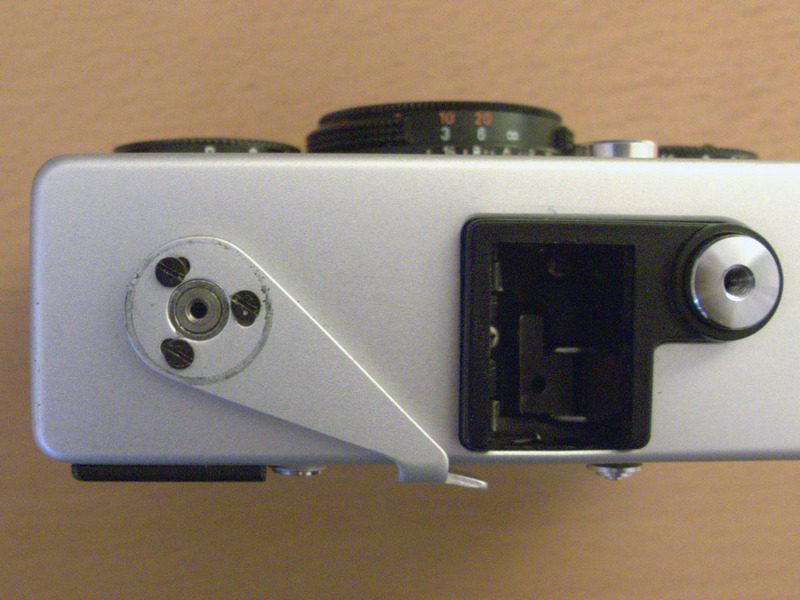 This photo shows the camera with the top-plate already removed and the rangefinder mechanism exposed. 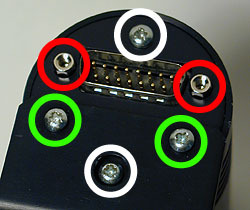 The screws circled in green hold the whole unit in place and are all that need to be removed. 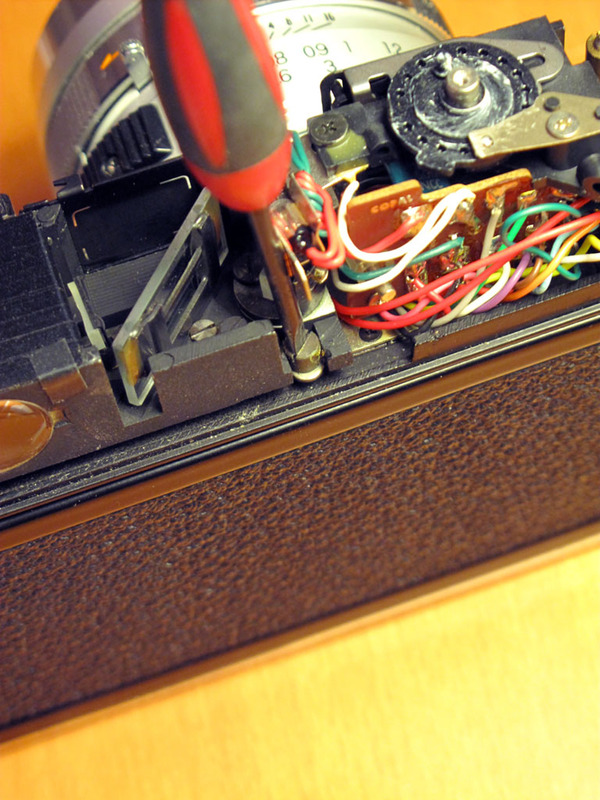 When removing it, lift out the left side first (where the film rewind crank is) and be careful of the Over / Under lights and other electronics on the right. 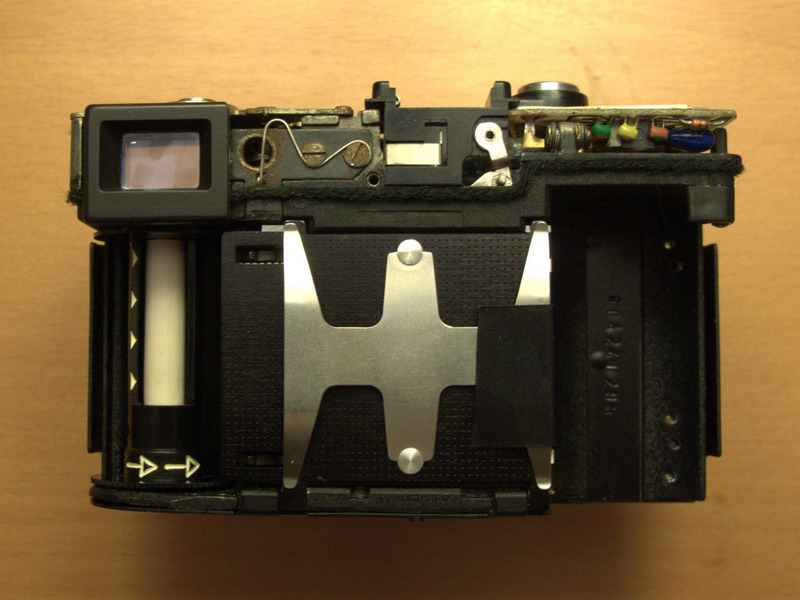 When replacing the rangefinder mechanism, tuck the right side under the electronics and it should just drop in to place. 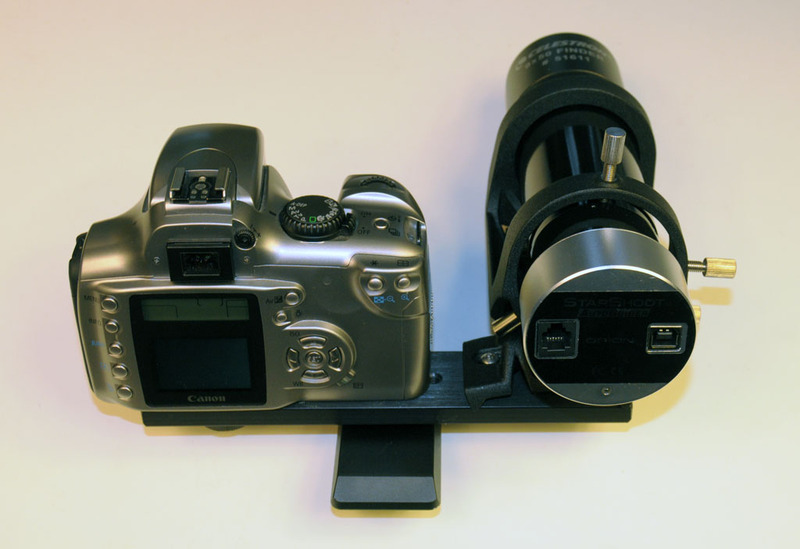 Don’t screw it down yet, as you will need to make sure the focusing lever is set in the lens tab in the next step. 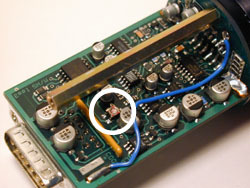 Note the location of the vertical focus adjustment screw circled in the photo on the right. 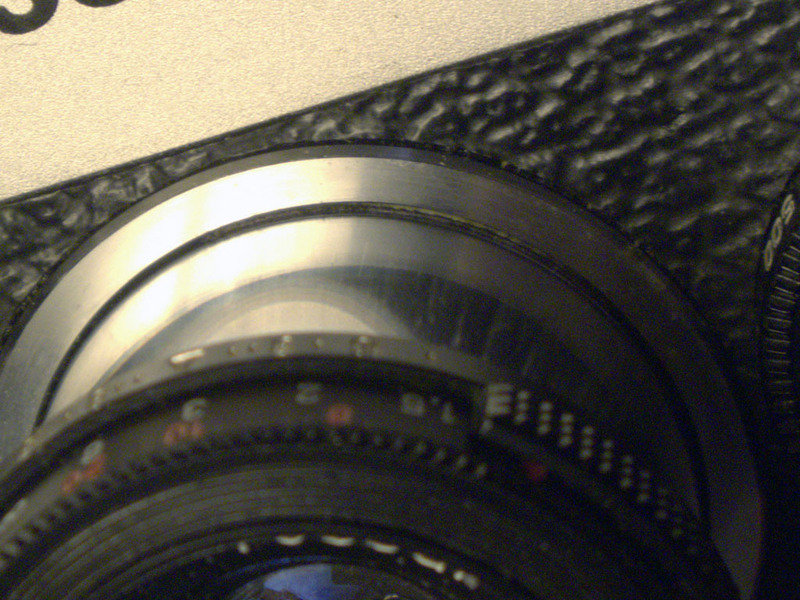 This photo shows the metal tab that keeps the lens indexed with the rangefinder mechanism. 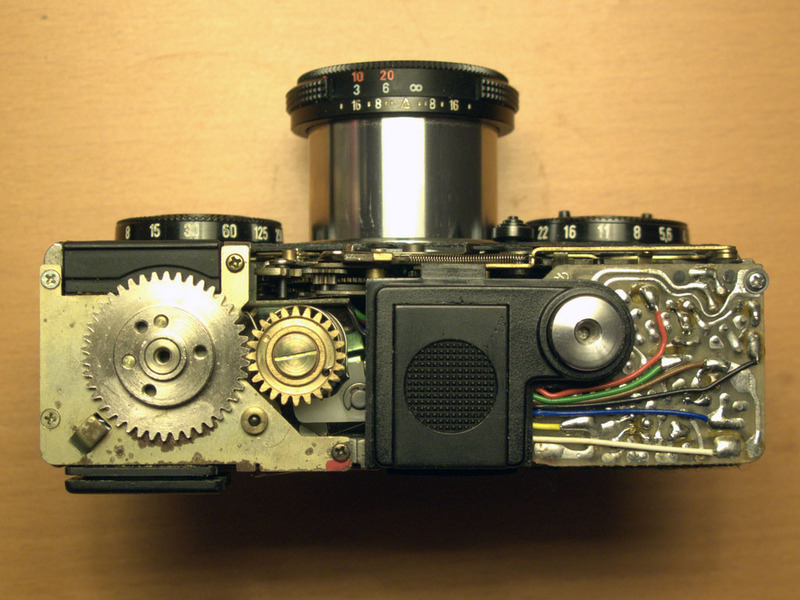 Underneath the rangefinder mechanism is a focusing lever that moves the mirror assembly back and forth. This lever needs to rest in a tab that is attached to the lens. 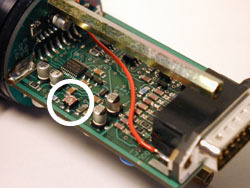 (Both are circled in the picture.) Once this is set, move the lens from close to far focus and back a few times to make sure no wiries are obstucting the movement or worse, getting pinched somehwhere in the process.After this step, you can screw the rangefinder mechanism in place and proceed with the final adjustments. 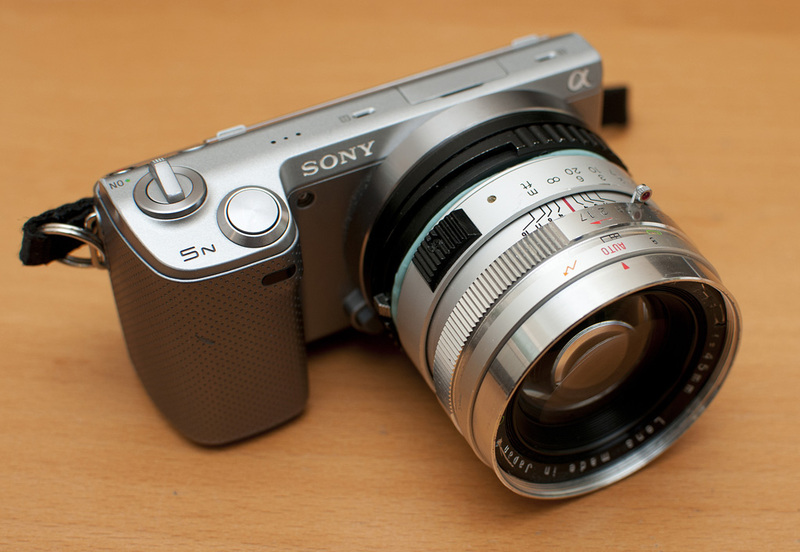 The final and most complicated step is adjusting focus so the lens is in register with the rangefinder mechanism. 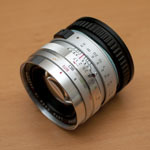 The method I found easiest was to set the lens to infinity and then adjust the rangefinder to that. 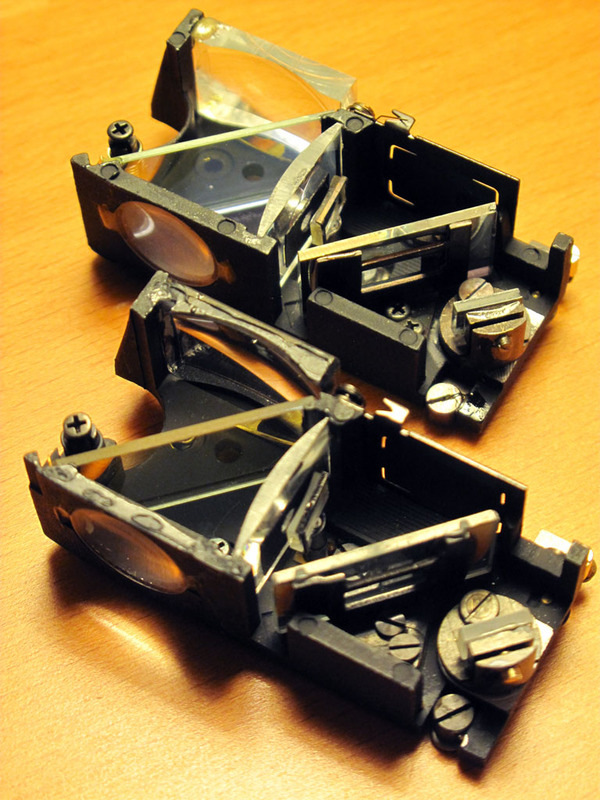 To adjust the rangefinder, there are 2 screws that control horizontal and vertical registration of the focusing square. 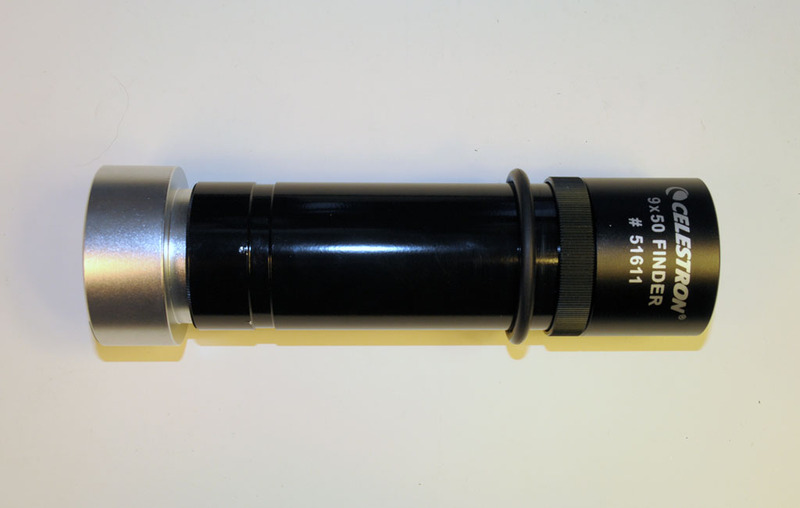 The photo on the right shows the location of the horizonal 45° adjustment screw. [It was pointed out to me (thanks Alfredo!) 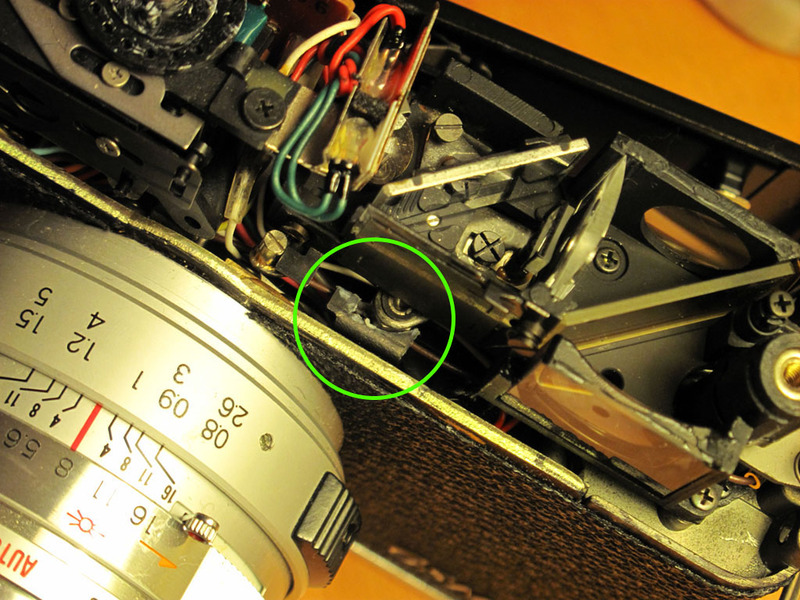 that the horizontal adjustment is the cross-like screw located next to the moveable rangefinder lens, labelled as “infinity adjustment” on page 36 of the GSN service manual.] 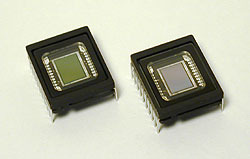 The vertical adjustment screw is shown two photos back. I was lucky and actually didn’t have to touch the verical registration at all. 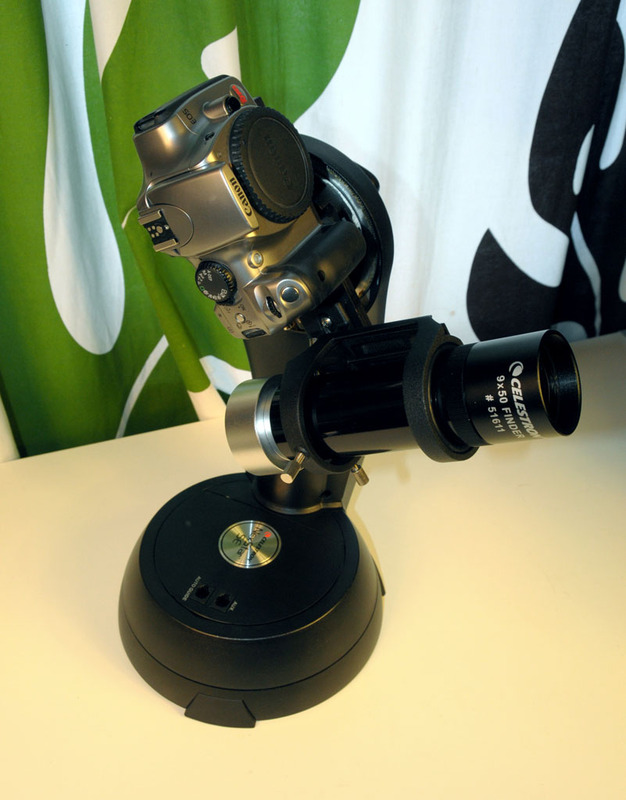 Mount the camera on a tripod and point the it at a distant object. I actually found it easier to do this step at night with the camera trained on a street light in the distance. 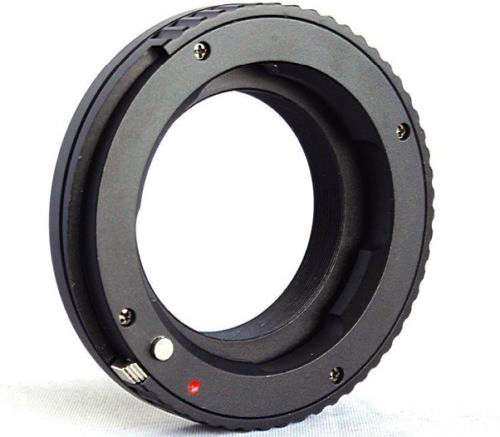 Set the lens to infinity marking – it should be right against the stop and not go any further. 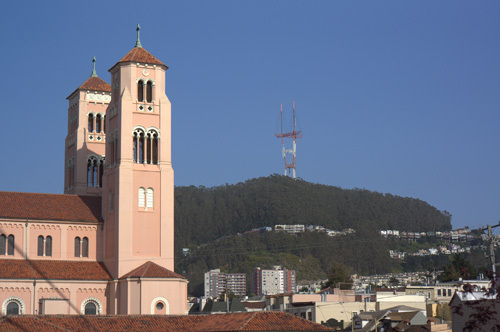 When you look through the viewfinder you’ll see whatever object you’ve trained on is “out of focus.” Just adjust the horizontal (and verical if needed) until the images register exactly. Go back and verify that the lens is still set to infinity and check focus again. Before putting a roll of film in the camera I wanted to be reasonably sure that focus was good. 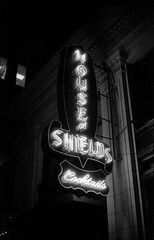 To do so, I used an old roll of film that I accidentally fixed but didn’t develop (Oops! 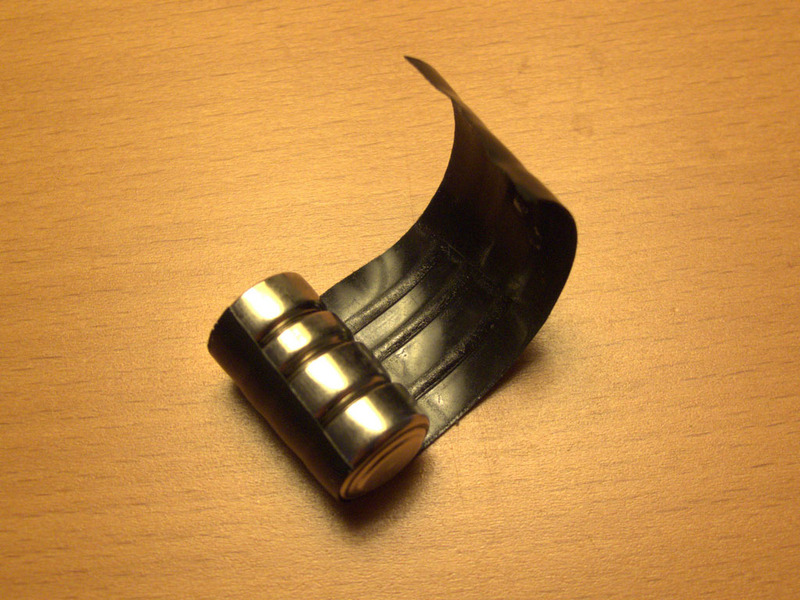 A couple of pieces of electrical tape would have worked just as well though…) to hold in place a square of material I cut from a soft CD sleeve. 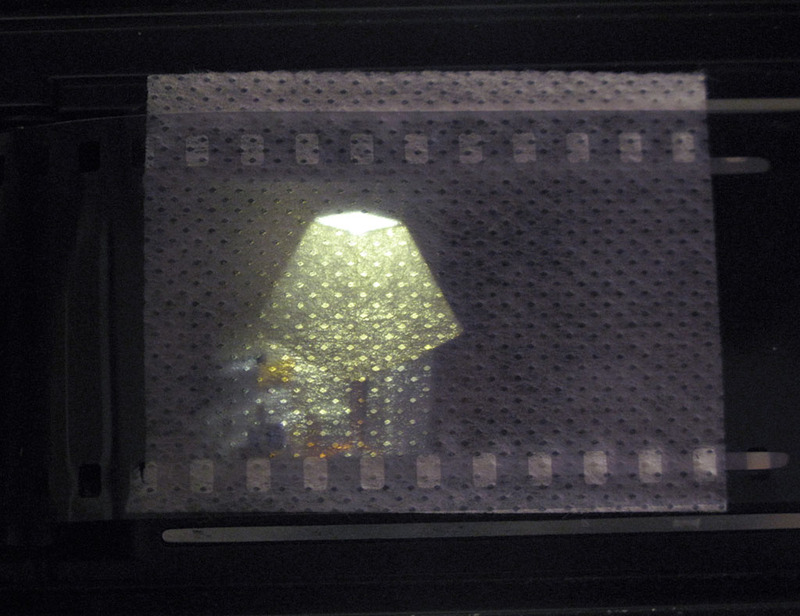 Here you can see what it looks like focusing on a desk-lamp at closest-focus on the GSN which is about 80 cm (or 2.5 ft). 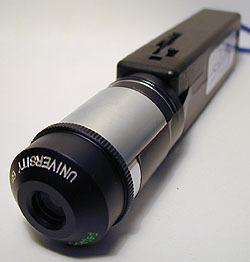 Looking through the viewfinder and looking at the back of the camera, the focus seemed to match well and focusing at a distant street light with the lens set to infinity showed an equally sharp image. This should be it! To keep focus from slipping, brush some clear nail polish on the adjustment screws and let it dry before assembling the camera. The surgery worked! My GSN is still in focus and the “new” focusing mechanisim is an astounding improvement. When putting the camera back together I used the newest looking bits from both and now the camera looks great along with working great.